The castle is located in what was once the very volatile border area between England and Scotland. Not only did the English and Scots fight, but the area was frequently attacked by Vikings. The castle was built in 1550, around the time that Lindisfarne Priory went out of use, and stones from the priory were used as building material. It is very small by the usual standards, and was more of a fort. The castle sits on the highest point of the island, a whinstone hill called Beblowe. 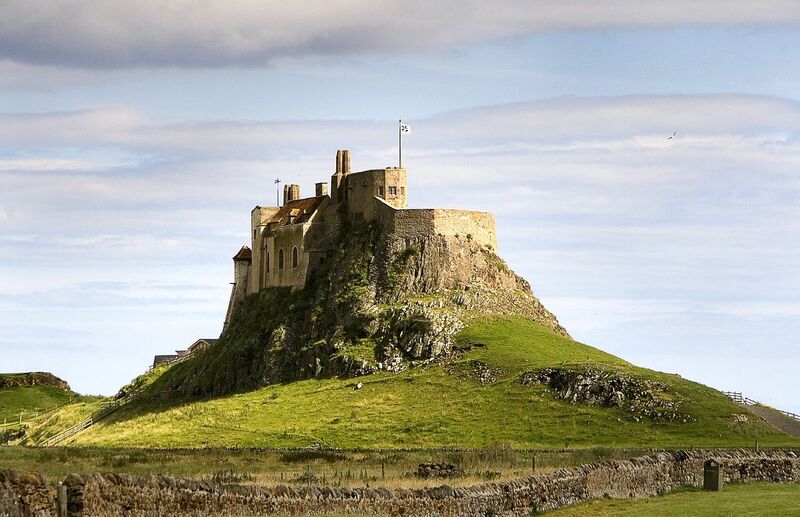 Lindisfarne’s position in the North Sea made it vulnerable to attack from Scots and Norsemen, and by Tudor times it was clear there was a need for a stronger fortification, although obviously, by this time, the Norsemen were no longer a danger. This resulted in the creation of the fort on Beblowe Crag between 1570 and 1572 which forms the basis of the present castle. After Henry VIII suppressed the priory, his troops used the remains as a naval store. In 1542 Henry VIII ordered the Earl of Rutland to fortify the site against possible Scottish invasion. Elizabeth I then had work carried out on the fort, strengthening it and providing gun platforms for the new developments in artillery technology. These works in 1570 and 1571 cost £1191. When James I came to power in England, he combined the Scottish and English thrones, and the need for the castle declined. At this time the castle was still garrisoned from Berwick and protected the small Lindisfarne Harbour. In the eighteenth century the castle was occupied briefly by Jacobite rebels, but was quickly recaptured by soldiers from Berwick who imprisoned the rebels; they dug their way out and hid for nine days close to nearby Bamburgh Castle before making good their escape. This entry was posted in PLACES AND TRAVEL and tagged Popular, Scotland. Bookmark the permalink. ← The Eiffel Tower in Winter, 1948.